RandomLine, Inc. is the creator of the award-winning SQUIGGLE® games, activity pads and doodle pads. We now have over 35 products that inspire the imagination, encourage creative thinking and provide a wonderful play experience for children and adults. Toysmith is our exclusive distributor. 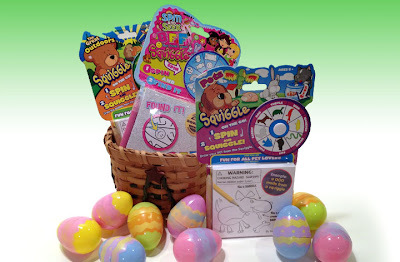 Enter to WIN these 3 SQUIGGLE Activity Pads for Easter! All you have to do is LIKE us and SHARE this post with your friends to be entered in a random drawing. We'll pick one winner on Monday, March 25, 2013. We will only mail to a valid US address. Our Themed squiggle pads are ideal for kids who have an interest in animals, sports, fashion, vehicles and more. These pads promote learning and encourage research. They are our # 1 goodie-bag item. Choose from 6 titles that range from ages 5 and up. Our SPIN and SEEK hidden-object games are a must have for any road trip. Spin the wheel then find the 3 objects hidden within thousands of squiggly lines. Play with a friend to see who can find the obects first. Look for additional titles coming soon. Ages 4 and up. Start Your Day Being Creative! If you're looking for away to start your morning and get your creative juices flowing, check out the Daily SQUIGGLE! Every morning we post a new squiggly line and ask our fans what they see in the squiggle. Fans post their comments and get other fans to like their suggestion. The fan with the most LIKES gets to see their suggestion come to life because we draw it up! Soon, we're going to start allowing fans to not only comment, but upload their own doodle creation with their smartphone. It is proven that doodling is a great way to increase concentration and improve your memory. I would suggest that you get a pencil and paper in your kids hand today. Check out the article below. Asked to remember names they’d heard on a recording, people who doodled while listening had better recall than those who didn’t. This suggests that a slightly distracting secondary task may actually improve concentration during the performance of dull tasks that would otherwise cause a mind to wander. "People may doodle as a strategy to help themselves concentrate," said study co-author Jackie Andrade, a University of Plymouth psychologist. "We might not be aware that we’re doing it, but it could be a trick that people develop because it helps them from wandering off into a daydream." Andrade’s findings, published Thursday in Applied Cognitive Psychology, are an interesting wrinkle on cognitive load theory: The mind has a limited amount of attention to give and, once occupied, stops processing other stimuli. "It takes a large cognitive load to daydream. That has a big impact on the task you’re meant to be doing," said Andrade. "Doodling takes only a small cognitive load, but it’s just enough to keep your mental resources focused on the main task." Andrade’s team asked 40 people to listen to a recording containing the names of people and places. Afterwards the people wrote down the names they could remember. While listening, half of the test subjects were also required to shade in shapes on a piece of paper. Afterwards, they remembered one-third more names than test subjects who didn’t doodle while listening. Citation: "What does doodling do?" By Jackie Andrade. Applied Cognitive Psychology, Vol. 23, No. 3, Feb. 26, 2009. If you have children, you may already be aware that electronic games, television shows and the world of apps have been infiltrating their lives. Our 2 little darlings are no exception. They LOVE their gadgets and TV shows, but my wife and I recently started to “unplug”. TV’s are off limits on weekdays and electronic games and apps are off limits on the weekends. Sure, we would love to unplug everything, but lets be real . . . our kids would hate us, so for our sanity too, we choose to slowly ween them off. Once we made this decision, our next step is to occupy their time in other ways. Play board games with them was a natural fit. At first, it was a bit of a challenge, mostly because I create board games for a living and the SQUIGGLE series of activity and doodle pads, so they have been put through the ringer as my testing guinea pigs. It has been 3 months and things are looking good on the home front. Now, when their friends come over, they are the ones suggesting they play a game and not sit in front of the TV or ipad. We are really pleased. Board games should be a part of every child's life as they allow kids to express themselves, build self-esteem, encourage creativity, inspire conversations and so much more. So why not pull out a board game this weekend and have some good old family time! There's a baby elephant in her tummy! 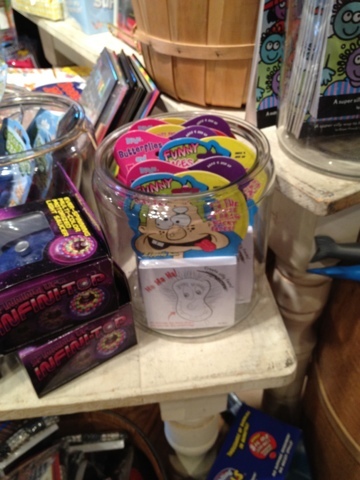 SQUIGGLE Monsters makes a wonderfully 'unplugged' gift, stocking stuffer and family activity this holiday season! This activity center is great because it encourages children to be creative as they transform squiggly lines into monsters! It′s perfect for taking out to dinner to give the kids something to do while they wait impatiently for their food! For ages 6 and up. SQUIGGLE Monsters is a fun and creative way to explore the wild and wacky side of your imagination! First you create a squiggly line on the dry-erase board, then you spin the wheels to select a combination of features to make your monster (ie. Two Heads - One Leg Monster). Next, it’s up to you to turn the squiggly line you created into that monster. The best part when you’re done is you get to make up “fun facts” about your monster on another dry-erase area. (i.e. Name, Favorite Food, Job, etc.) Play with friends and create your monster master piece. As a kid, I was a doodler in school! I was the kid who sat in class and filled my notebook cover with thousands of squiggles, pictures, pattens, and bubble letters. I couldn't and still can't go anywhere without a pencil and paper in hand armed and ready to sketch. I'm a visual person and need to sketch every idea and thought out to get a clearer picture. If I'm at a doctor's office, waiting at the DMV, or just sitting at the kitchen table my pen will uncontrollably begin doodling. Once a doodler, always a doodler. Another trade show wraps up tomorrow. I'm heading back from the Dallas Toy Preview where vendors like myself and Toysmith (our exclusive world wide distributor) show new toys and games that are in the pipeline for 2013. This show is a bit different from the New York Toy Fair because you have to set your appointments with buyers. . . . they don't just show up at your booth to see what you have to offer. It would be a costly mistake if you don't plan 4-6 weeks in advance to get the decision makers to your booth. We met with buyers from the likes of Learning Express, Micheal's, Barnes and Noble, Toys r us and many more to show them what new items we created. This show is a great way to gauge the reaction and interest level of the retail buyers. If you don't get the OK nod when you meet and explain a new product, you can easily go back to the drawing board a fine tune the concept, design and price. Trade shows can be pretty exhausting, but I'm already looking forward to the next show . . . New York Toy Fair 2013! Ok so technology is cool . . . We all know it!, but there is something to be said about games that don't require batteries or make noise or cost a fortune. Squiggle games and Zippidy Doodle activity pads are just what parents need for the car before they take a long road trip. These fun activity pads encourage creativity and spark imagination. Zippidy Doodle is available at Cracker Barrel locations. MORRIS PLAINS, NJ – August 1, 2012 – RandomLine’s latest creative creation just hit the toy store shelves and it’s called SQUIGGLE Selection. Take a bit of Apples to Apples, mix it with drawing and creativity and add some random fun and you get a hilarious new drawing game. “I love playing off the wall games with my family, but I also enjoy quiet, creative time with them too, so blending the two into a new game was a fun challenge” said John Kiely, Chief Squiggler. SQUIGGLE Selection is quite simple. Players create a quick picture that starts with a squiggly line. The judge for that round picks one voting card from the deck that reveals a word and awards it to the drawing that best suits that word. Here’s the twist . . . players create their drawing before the card is picked, but each player gets a chance to convince the judge with a clever explanation why their picture best describes the word. The first player to earn 4 voting cards wins! For ages 8 and up, retails for $19.99. RandomLine strives to leverage the success of SQUIGGLE and continues to grow this strong and popular brand. Many parents look for alternatives to digital games that will inspire creative thinking and keep children engaged and RandomLine games are the perfect solution. Visit www.randomline.com to learn more about this new and innovative company. Toysmith is the Worldwide exclusive distributors for RandomLine and the of SQUIGGLE line. Sumner, Washington – Toysmith, a leading specialty toy and gift company, is pleased to announce it has finalized a distribution agreement with RandomLine, Inc. Effective immediately, Toysmith is now the exclusive distributor of the RandomLine, Inc. brand of products. RandomLine, Inc. was created in 2002 by John Kiely, a dad who loves to play. His goal is to offer products that encourage children to be creative and use their imagination. No Noise. No Batteries. Simply Imagination is RandomLine’s motto. RandomLine’s primary brand is Squiggle®. Squiggle products are based on the idea of a squiggly line. Squiggle is a fun doodling activity that can be done anywhere! Products include an assortment of Games, Just for Fun On-the-Go Activity pads, Educational Activity Pads, Themed Doodle Pads, and Wipe-off Drawing Pads. John Kiely, Chief Squiggler and Owner of RandomLine, Inc stated, "I am thrilled to have a company like Toysmith recognize the potential of the SQUIGGLE brand and RandomLine products. Their involvement is going to present incredible opportunities and allow me the creative freedom to continue product design and development for the SQUIGGLE brand and beyond." Toysmith will begin shipping RandomLine products starting in October 2011. 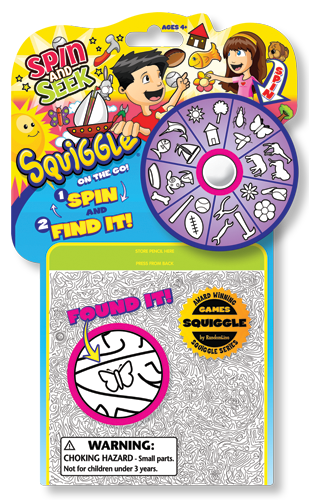 Jeff Bunkowske, National Sales Manager of Toysmith, stated, “We are excited to be the exclusive worldwide distributor of Squiggle® Series games, doodle pads and activity pads. These educational products are recognized throughout the industry for encouraging creativity for all ages. Bunkowske added, “The addition of the Squiggle® Series line further expands our comprehensive offering of children products that provide open-ended play, stimulate children’s minds and encourage creativity and discovery. 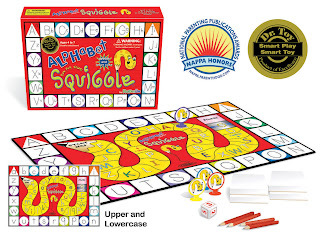 Specialty retailers will be able to add the Squiggle® Series products to their Toysmith orders to get the best in-stock service, discounts, freight and dating terms”. 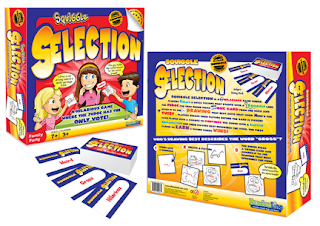 RandomLine, Inc. is the creator of the Award-Winning SQUIGGLE® Series games, doodle pads and activity pads. Designed and developed to provide educational benefits, energize creative thinking and encourage creativity in children to adults. 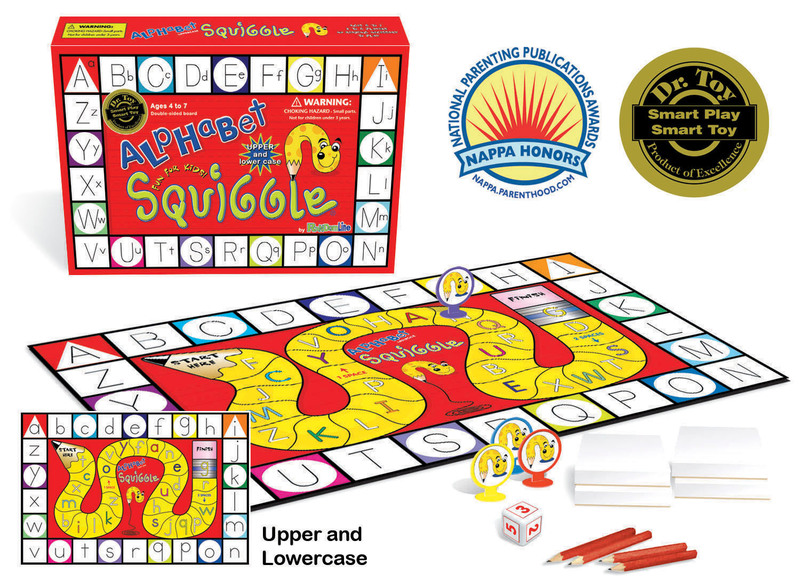 SQUIGGLE® is available in Barnes & Noble as well as the specialty toy market, educational stores, bookstores, gift shops and museums throughout the United States, Canada, New Zealand and the UK. Visit www.randomline.com to learn more about this innovative company. Since 1982, Toysmith has been providing the best in programs and customer service for specialty retailers, offering a growing family of award-winning specialty branded toys and gifts emphasizing fun for children of all ages. Its products are sold worldwide to Specialty toy retailers, education market, craft and hobby, museums, zoos, aquariums, national parks, attractions, theme parks, gift stores, specialty catalogs and internet retailers. Contact: Sales Support at 1-800-356-0474. SQUIGGLE games are so much fun! They aren't only educational, but also inspire your children to create and use their imagination.RandomLine has now released an extensive line of SQUIGGLE drawing pads and games. SQUIGGLE Mix Up and SQUIGGLE Monsters are on our SQUIGGLE holiday wish list. :) The thing I love the most about SQUIGGLE games is that they are powered completely by your child's imagination! The Thrifty Things: Hurry Up! For Family Game Time: "I am always trying to find new ideas for 'Family Game Night' at my house. 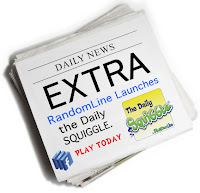 Sometimes I want something simple, something that doesn't make lot..."
RandomLine is proud to announce the launce of the Daily SQUIGGLE on Facebook. What is The Daily SQUIGGLE? Who can participate in The Daily SQUIGGLE? Anyone. But you must “Like” the Daily SQUIGGLE or RandomLine first. The Daily SQUIGGLE is a kid-friendly site, so use discretion when posting a comment. Any inappropriate comments will be deleted. How to participate in The Daily SQUIGGLE? Each morning, a squiggly line is posted on our Facebook wall and we ask our FANS what they see in the squiggle. Once a FAN adds a comment, they can “Suggest to Friends” (located in the left column under the logo) or SHARE with friends to accumulate the most “Likes” on their comment (see the NOTES tab for a visual explanation). The FAN who gets the most “Likes” on their comment will see their guess come to life in a drawing the following day. We’ll do our best to create it! If there is a tie, we at RandomLine will choose the winner by adding our “Like”. Monday through Saturday is for fun, but every Sunday, our FANS have a chance to win a $10 gift card at Barnes & Noble and a SQUIGGLE On-The-Go doodle pad. The FAN with the most “Likes” on their comment wins. RandomLine can participate as well and “Like” a comment. The Sunday contest will end at 8am EST Monday morning. Prizes will be awarded and shipped to a US address ONLY. Winners will be notified by a direct message for their information. The Daily SQUIGGLE is brought to you by RandomLine. 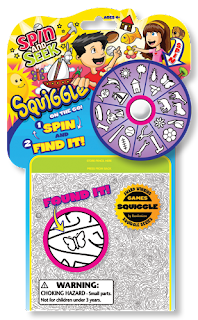 We are the creator of the SQUIGGLE Series games and creative doodle pads for ages 4 to adult. My name is John and I started RandomLine in the year 2000 after realizing I wanted to create my own destiny so I started to develop a game. In 2002 I brought my first game to market . . . SQUIGGLE! From then on, I created and created more and more games and doodle pads which eventually became the SQUIGGLE Series. 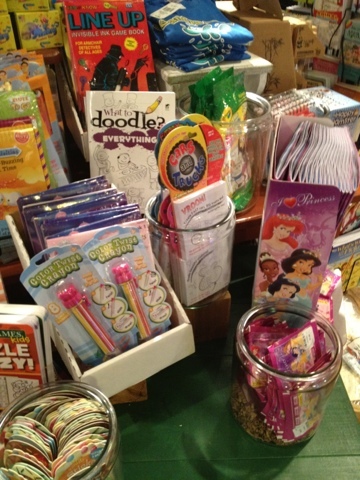 RandomLine now has over 35 products in over 3000 toy stores, gift shops and book stores! I have a ton of energy, I'm motivated and ambitious and I don't like to sleep much!